Three baroque angels : SATB with orchestra / words by Thomas Shapcott ; music by Colin Brumby. Three baroque angels : for mixed choir and orchestra / words by Thomas Shapcott ; music by Colin Brumby. 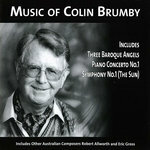 Baroque angels : music of Australian composers / Colin Brumby ; Eric Gross ; Robert Allworth. 1979: 30th Intervarsity Choral Festival, Brisbane. Featuring Queensland Youth Orchestra, John Nickson.